Like so many others, my heart goes out to the people of Japan. Tomorrow's Bake Sale for Japan happening all across the nation is just a small and simple way for me and others to help in some way. And as the quote at the top of the bake sale site says, "Small acts, when multiplied by millions of people, can transform the world." I believe that. As I thought about what I wanted to contribute, I had a desire to make something symbolic of new life and new hope. The butterfly seemed perfect. There are many wonderful bloggers (New York ones listed here), homemade bakers, and incredible local bakeries donating goods to tomorrow's New York bake sale. Thank you to the organizers and all those contributing goods and donating funds toward Peace Winds Japan! And a personal gratitude with much love to my sister-in-law for watching the boys and allowing me to get these ready for tomorrow! 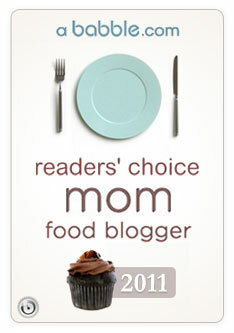 And also a huge thank you to Alice of Savory Sweet Life for saving the chocolate cupcakes with her killer recipe. 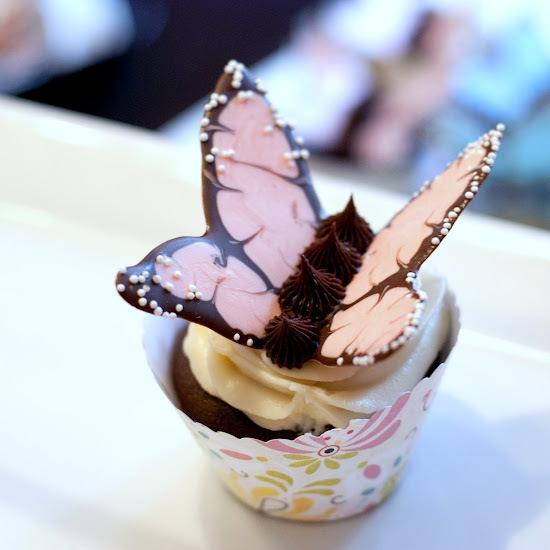 I know folks are curious, so I'll post a 3-part series next week on how these cupcakes came together. In the meantime, they're packed and ready to go. If you're in the New York area, please come out to Brooklyn Flea tomorrow and support this wonderful cause. To the people of Japan and all those affected by the recent disaster, may God heal your land, your hearts, and fill you with great Hope in the midst of great tragedy. Our thoughts and prayers continue to be with you. 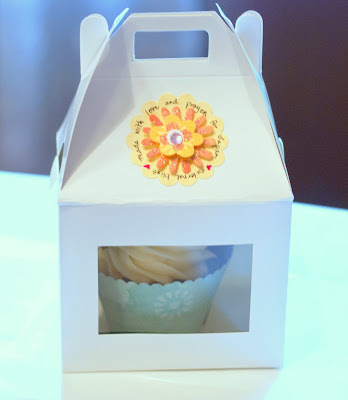 I would love to buy those beautiful cupcakes from you, Rachel! What wonderful way to help Japan. Hugs! these are beautiful!! looks like a great, fun project with a purpose. seriously, so beautiful!!! love the symbolism!! ahhhh~~!!! The butterflies are simply gorgeous...! Good on you that you're trying to help Japan by doing a bake sale :)! Rachel I am speechless! 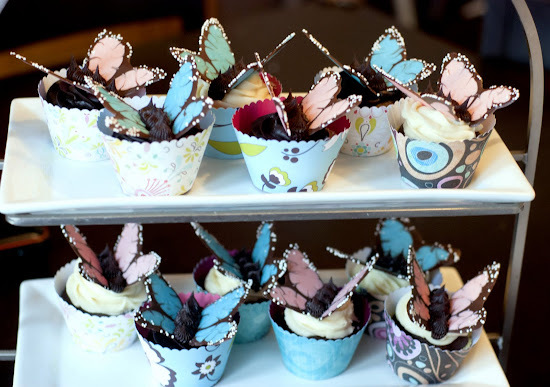 These are such beautiful cupcakes, and the butterflies have such intricate detail in the wings. What a great symbol for the wishes you send to Japan. These are gorgeous! Really something special! 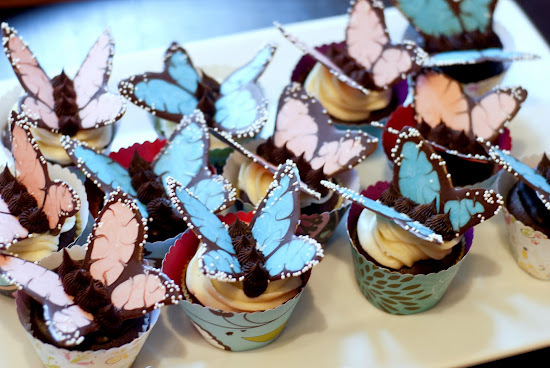 These cupcakes are gorgeous, the butteflies are soo beautiful, especially knowing what they represent and how they'll help. Looking forward to seeing how it all came together! So pretty! I retweeted the link and my brother was impressed. Jane and I saw "Hello Cupcake" at a store once and we were so tempted to buy it (we resisted). I might get that for her on her birthday though, she's into baking lately. Found out recently that she was baking macarons too! So how many cupcakes did you make and how on earth did you transport them all? !